Carsen Edwards, left, of Purdue goes up for a basket against Dajour Dickens of Old Dominion in a first round NCAA Tournament game at the XL Center in Hartford, CT on March 21, 2019. And here’s the thing about Edwards: He likes every shot. If it happens too often, however, it can take a toll on the scoreboard. Edwards takes a third of his team’s overall shots, three-point attempts, and scores a third of their points. He averages 23.1 points per game and, again despite his size, is projected to be taken early in the second round of the upcoming NBA draft. There’s a lot more to this matchup for Villanova than contending with Edwards, but he was high up on the scouting report. The Wildcats will also be dealing with a team that matches their length and physicality, and might be their superior in rim protection. So, perimeter play will be key at both ends of the floor. Carsen Edwards, center, of Purdue drives against Xavier Green, right, of Old Dominion in a first round NCAA Tournament game at the XL Center in Hartford, CT on March 21, 2019. Purdue has been surprisingly good this season, similar to Villanova, despite heavy losses from last year’s 30-win team. The Boilermakers have reached the Sweet 16 round of the NCAA tournament in each of the last two years, but came into this season without four senior starters from the 2017-2018 team and their collective 5,142 career points. If there is a notable trend that bodes well for Villanova, it is that Purdue was 15-0 at home this season and just 9-9 on the road, including a 3-3 record at neutral sites. The Boilermakers don’t seem to travel well for some reason, and when they win on the road it is often because Edwards gets hot. But, boy, he can get cold, too. Edwards, who is from Houston, was a late recruit to Purdue, which had lost a commitment to another guard. Coach Matt Painter had choices closer to home, including Xavier Simpson from Ohio, who eventually went to Michigan, and Te’Jon Lucas from Milwaukee, who initially went to Illinois. Painter settled on Edwards, though, and can live with some shots taken with more optimism than restraint. 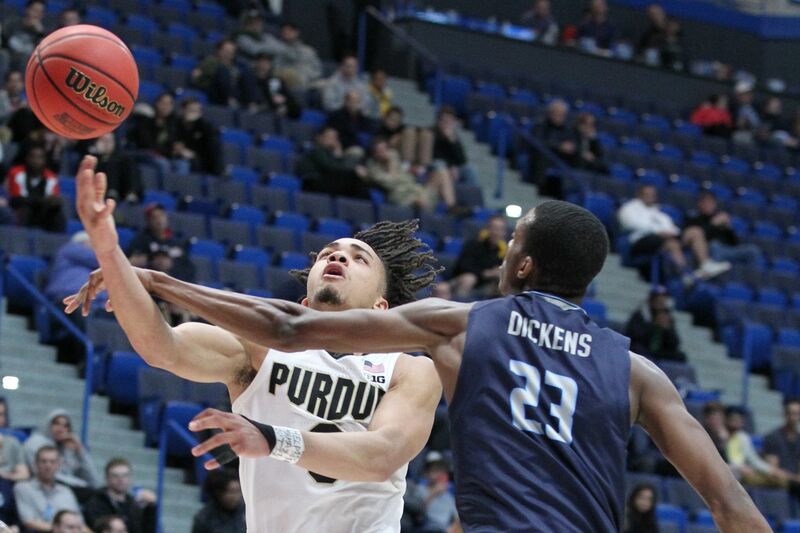 Purdue didn’t figure it out against Villanova at the start of the 2016-17 season when the Wildcats went into Mackey Arena for the Gavitt Games and beat the Boilermakers, 79-76. It is one of only four home losses for Purdue in the last four seasons, and the only one to a non-conference opponent. Of course, shooting from a little more distance than most are comfortable with is nothing to Carsen Edwards. He’s fine with that. Shooters get shots. Whether they go in is another matter, and the outcome of this game might ride on that small question.